Here's another member of that prolific genus, Kalanchoe delagoensis, sometimes also known by its older name of Kalanchoe tubiflora. 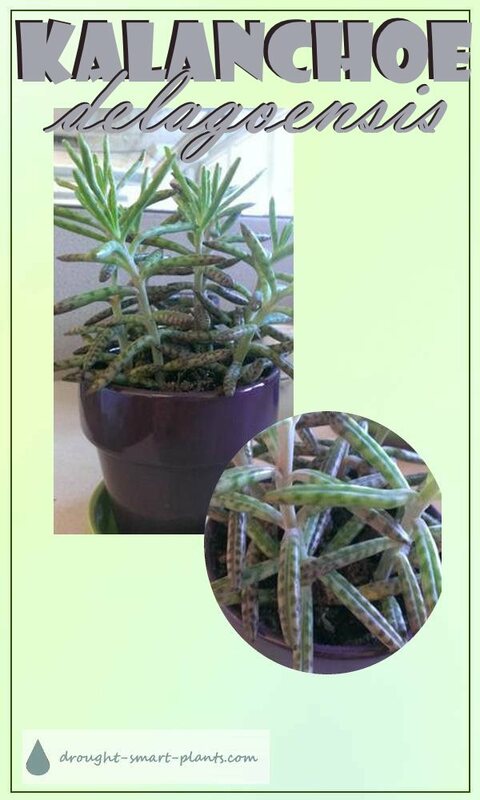 It resembles its cousin Kalanchoe daigremontiana in the colouring of the leaves, its rate of growth, and its trait of producing tiny plants on the edges of its leaves. In some areas, it's been cursed as a noxious weed, as anywhere that doesn't get a killing frost can be a haven for this plant. The tiny baby plantlets can survive nuclear holocaust, and spring up untouched. In places like Florida, or it's native Madagascar, it's been outlawed for the ability to spread by the dropping of its propagules, which run rampant if not weeded out. If you insist on growing this plant, please keep in under control. Unique and interesting it may be, but it's just too anxious to take over the world to allow it grow uncontrolled. The other Mystery Plant - Kalanchoe?